The Enigma top quilt from Enlightened Equipment is an ultralight sleep quilt that keeps you warm at a decent value. The “shiftless” baffles help keep down in place. The pad attachment system works really well to give you the most comfort and options under your quilt. The Enigma has a sewn footbox to maximize weight savings. This is a review of the Enlightened Equipment Enigma backpacking quilt. Enlightened Equipment (“EE”) is a cottage gear company in Minnesota that makes high quality top and under quilts that are extremely light, provide a wide set of options to choose from to customize the quilt how you want, and all for a good value for the money. They also make a few related products (down booties, down hoods) and a few other things. Between my daughter and me this is the third EE quilt I have purchased. I am not affiliated with Enlightened Equipment in any way. The idea behind a backpacking quilt vs. a sleeping bag is that in order for insulating material to work it needs loft, and in a sleeping bag the insulation under you, especially down, is squashed by your body weight and so isn’t lofted and thus isn’t insulating you, so it really just amounts to dead weight. 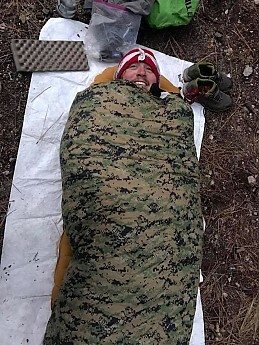 In addition, a sleeping bag can be confining for many sleepers, especially those who sleep on their side, draw their legs up, splay their arms or legs out, or roll around during the night. A backpacking quilt resembles a sleeping bag that has had a little surgery to address these issues. There is no underside from about your knees up—a backpacking quilt is open on the underside, and you lie directly on your sleeping pad, so you want to be sure to use a pad with an R-value that will provide the insulation appropriate for the temps you’ll be facing. A quilt does not have a hood so you will want to be sure to wear a hat on colder nights. The result is a more efficiently-designed piece of gear that uses less material and thus its other two main benefits, a quilt is lighter than a comparable sleeping bag, and therefore it packs down smaller. 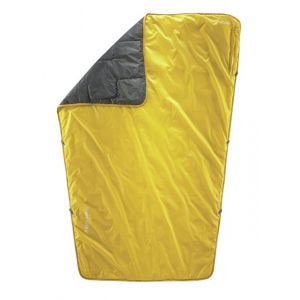 A backpacking quilt also has the ability to offer a lot more room inside or to snug around you more on colder nights. You can choose 800, 850, 900, or 950 fill power down. The down can be DownTek treated or not. You can choose x-short, short, regular, long or x-long length. You can choose slim, regular, wide, or extra-wide width. You have your choice of 9 inside colors, 16 outside colors in 10D fabric, and another 7 choices for the outside in 20D. You can choose from six temperature ratings, from 50F to 0F in 10 degree increments. EE down top quilts come in two main styles, the Enigma and the Revelation. They are identical in most respects, the only difference is that with the Enigma the footbox is sewn, which saves a bit of weight but gives up versatility, whereas with the Revelation the footbox closes with a zipper and a drawcord, which add about a half-ounce, and that allows you the option to open the footbox partially or even all the way open flat. The standard fabric is a 10D Phantom, with options to leave the whole outside in 10D, get the whole outside in 20D or just the head and foot in strips of 20D. 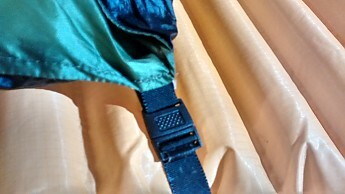 The 20D strips incur a very slight weight penalty, and they might be chosen for a bit more water resistance at the areas most likely to be closest to the sloping walls of a tarp or near where you breathe (so as a precaution against condensation), and/or for the aesthetics of 2-tone coloring. When I got this quilt it was called the “Pro” version, but since then EE has phased out the branding of different fill power versions, so no more “Pro” version or “Elite” version. No change to the product they just simplified the names. EE top quilts feature a “shiftless” baffle construction—the baffles from the head end to about the knees are vertical, which helps the down stay in place. Then around the footbox the baffles are horizontal. The quilts come with attachment straps that you snug around your sleeping pad that hold the quilt in place around you and allow you to slide the attachment points out to the edges for more ventilation and room inside, or you can slide them in closer in under you to wrap the quilt more tightly around you, minimize venting, for more warmth. EE quilts also come with a stuff sack as well as a larger sack for storing the quilt uncompressed. My Enigma is a 30°F in size regular/regular with 850fp and weighs less than one pound, right on spec with the manufacturer’s posted weight. Mine is all 10D fabric, black inside and forest green outside. The materials and construction are all of high quality. My quilt measures to spec, and other owners also report that EE provides accurate dimensions and sizing. My quilt lofts extremely well. I have found the temp rating to be accurate. The Phantom fabric is soft against the skin and is not prone to shedding down. The "shiftless" baffles truly are—with horizontal baffles across the torso on other quilts I’ve had problems with my movements during the night moving the down from the center of the quilt down to the sides, leaving me cold, but with the baffle design on the EE quilts the down stays put. My 30°F Enigma packs down small, to about the size of a cantaloupe if I compress it, although in practice I don’t compress it in my pack. My EE quilt provides plenty of room inside and provides a very comfortable night’s sleep. I sleep on my side and roll around a bit, and I have never been truly comfortable in a sleeping bag. I always feel confined and twisted up with the bag. A backpacking quilt, on the other hand, is designed for a sleeping experience more like being in your bed at home. You lie underneath your quilt, between the mattress and your quilt top, with room to your sides if you want. Your feet go down into an enclosed footbox, like the bottom of a sleeping bag, so that they don’t accidentally poke out into the cold during the night. At the open head end, you can have the quilt spread wide like a blanket on your bed at home, or if it’s cold or just if you generally like to cuddle your blanket around you, the EE quilts have a snap to hold the head end around your neck and a thin drawcord to adjust it more loosely or more tightly as you want it. I like to have my bedcovers pulled snugly around my shoulders and neck but then with room underneath for my torso, arms and legs to move about, and the EE quilt allows this perfectly. 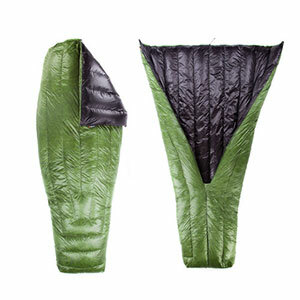 Because of this design you can regulate how much warmth you get from your quilt, better than you can with a sleeping bag. With a backpacking quilt it’s easy on a warm night to stick a leg or arm out or to let the sides fall open for ventilation, or on colder nights to cinch it around you and seal off drafts. 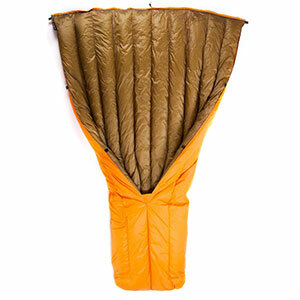 The quilt attaches to your sleeping pad via a strap attachment system. 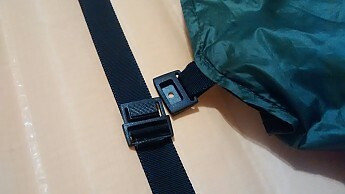 In my photos is EE’s old strap system (non-elastic adjustable), which I prefer, their new strap system is made of elastic so no adjustment hardware needed, however I’ve found that the elastic straps can pinch in the sides of my air mattress quite a bit, which can become a channel to allow drafts in. 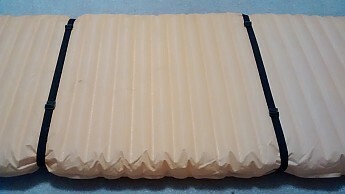 And if your pad is designed with vertical air chambers then the elastic straps can cause the pad to fold up and “taco” when you aren’t lying on it. But with either design the idea is that the straps snug around your pad and then the pad has sliding clips on the straps that mate to clips on the quilt, which holds your quilt in place over you. 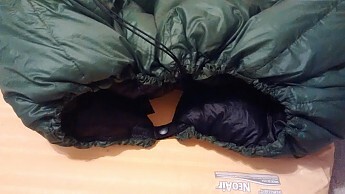 If you want more room inside you can slide the clips out towards the edges, and if you want to cinch down more snugly on a cold night you can slide the clips in towards the center. I find this design to be very comfortable, warm, and flexible. The only negative I have experienced with my quilt was only a temporary and minor annoyance. When it first arrived from EE it smelled like bird, which is about as pleasant as wet dog smell. I washed it with Down Wash, fluffed it in the dryer and let it air out for a week and it’s been fine ever since. There were a few other customers with similar issues around the time I got my quilt (Spring 2014) so probably was just a batch of down that had not been washed thoroughly at the factory. I have not heard of this being an issue with EE quilts since then. Finally EE’s quilts are very price competitive. They are among the lowest price of any cottage quilt company yet do not compromise on quality. 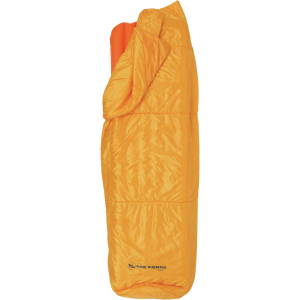 And compared to some of the primo brand name sleeping bags (that weigh more), an EE quilt can be a real bargain. Treated well, a high-quality down backpacking quilt can last for decades. Thanks for another super helpful review, JRinGeorgia! Solid lightweight option for those looking to spend a significant amount of time outdoors in a variety of environments. This quilt is also great for those more mobile sleepers who never seem to wake up in the position they went to sleep in. While I am a big fan of this product, I wouldn't recommend this to less-seasoned individuals who are heading out for shoulder season trips. I have had the pleasure of using this quilt for over 200 nights of outdoor slumber. What follows is my detailed review. It is important to remember the regular length quilt was rated to 0° fahrenheit, my dimensions (5'9" 150 lb), and the fact that I am typically a warm sleeper. Warmth: The biggest flaw of this quilt is the failure to properly trap all of the heat that you generate due to the inability to create a complete enclosure. While this can be mitigated with pad straps, the problem itself cannot be eliminated. Without using straps, I would say my 0° bag was comfortable to 30° if I wore my base leggings and long-sleeve base layer. The other issue for heat retention is the quilt lacks a hood, which also results in a cooler rem cycle. The advantage of this is that you can use this quilt in nightly temperatures below 30°, as well as 65°. Fit & Comfort: The regular length quilt is perfect for someone between 5'6" and 5'10" but larger or smaller individuals should consider other lengths. The material used is remarkably soft and feels like you're being snuggly squeezed by a squad of teddy bears, while being whispered words of reassurance and safety. 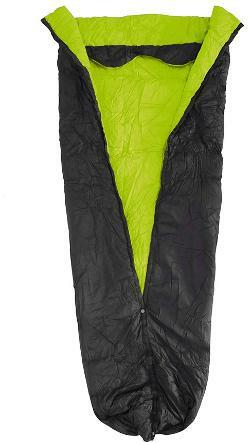 On warmer nights, the quilt can be used as a blanket and or adjusted to rest a leg or two outside the bag. Entry and Exit: As a rule of thumb, quilts are easier to get into than mummy bags. The Enigma is no different. Entry and exit are as easy 1,2,3, as simple as doe, ray, me. HOWEVER, if you are using the pad straps the entry and exit become significantly more difficult, think solving a Rubik's cube for the first time. Moisture: I've probably cowboy camped with this bag as much as I have slept with it inside a tent or under a tarp and the ability to wick away moisture has been consistently impressive. The quilt is treated with DownTEK which beads moisture on the outside of the bag without allowing it to permeate the down itself. While I would recommend avoiding getting your bag wet at any cost, the DownTEK does provide an additional layer of security worth paying for. Packability and Loft: Packability and lofted are fatally intertwined. The frequency and size of compression directly correlate to the lifetime of the loft. Additionally, any dirt, sweat, or other hiker realities dirtying up the bag can also reduce loft over time. During my thru-hike of the PCT I would compress the quilt to 15-20 liters, or approximately seven medium pizzas stacked on top of each other, though it could be made much smaller. I tried to avoid taking all of the air out of my quilt while packing and would unpack it during every lunch break. While the loft did decrease over time, it returned to near new quality after a wash at the conclusion of my trip. Construction and Durability: To me, this may very well be the most important aspect of any gear. The Enigma is carefully crafted from high-quality materials which results in a multi-year sleeping container. After over 200 nights of keeping me warm I have yet to find a frayed thread, hole, or any other issue that could impact product performance. Pictured above: Attempt at staying warm while cowboy camping. Note, the Sawyer Squeeze did end up cuddling up in the quilt. Pictured above: Although the quilt is hard to see, the digital camo pattern allows for maximum stealth while cowboy camping. Great review, Bruce! Thanks for taking the time to share it. What Alicia said. Accurate info. I'd add the customer support is excellent! That's interesting about the sizing and gives me reason to pause. You wrote "The regular length quilt is perfect for someone between 5'6" and 5'10" but larger or smaller individuals should consider other lengths." EE suggests a regular length for people up to 6'-2". The idea is that a separate down beanie or hood would be required. I'm 6'0" and was planning on ordering a regular Revelation (not Enigma, but same size recommendations). Did you wear something over your head for warmth? As for the straps being a Rubik's Cube, did you run BOTH of EE's straps around your pad? I've read it suggested just to wrap the lower strap around the pad, otherwise, it becomes too taut and difficult to get into the quilt. I would say the length depends on how far up you like the quilt to go. If you're cool with it going up to the top of your sternum, maybe a hair higher, the regular would be fine. I like to pull mine up and over my chin and sinch it tight from there, otherwise it felt like I was wearing a tie all night. You also need to remember you won't be able to play with as many positions if you fill out the quilt and it is more taught. Your feet will also really have to be snug against the end of the foot box. It is really a preference thing. However, I only have owned one quilt from EE, so perhaps mine was a hair on the small side. Their sizing recommendations are based upon their years of construction. I might email them and say that you are on the border of their sizing chart and ask what sort of return or exchange you could do if you don't like the size. I routinely wore my hat to bed during nights that it was below 45 degrees fahrenheit. I would say if you're planning on using a quilt outside of the summer, you should plan on sleeping with a hat on as well. As for the straps you make a good point. I was using both straps on cold nights but the reality is you just aren't going to be as warm with only one of the straps. Again, this would be a preference thing and depend on the rating of the quilt and temperature of any given night. You can always bring the two straps. I don't remember what their combined weight is but I can assure you that it is in the unnoticeable category. I hope that helps. Let me know if you have other questions. Thanks, Bruce. It's also important to remember that the Enigma has a closed foot box, thus less heavy then it's counterpart the Revelation. Small weight savings, as the Revelation has a zippered foot box. I sold my Revelation for this reason when I upgraded to a 10 degree, vs. 20 degree Revelation. Good review, and I love the Enigma for 3 season backpacking. Love the pix! Bruce... understood. I have a Mass Drop/EE 35 degree quilt they offered awhile back, and went with the regular "Up to 6 foot" suggested length and i was fine with it under my chin, with a wool beanie. I sleep with my kneesa bit bent anyway. But one shoulder season night, i was cold, but that was to be expected with a 35 degree quilt. i'm leaning towards a regular length Revelation at 850 fill, but in a wide width. just need to decide between 0 or 10 degree for sierra shoulder seasons. 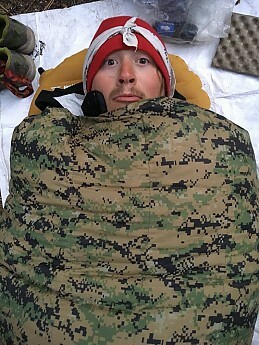 I'm a warm sleeper, and use a Thermarest XTherm pad, moving on from a 15 degree down sleeping bag. good review, thanks! I couldn't be happier. Custom made to order, value priced, as light as you want them to make it. Temp rating is accurate to a bit conservative. 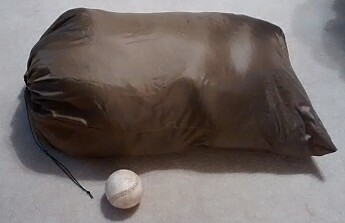 Having seen the "light" in ultralight backpacking, I made a 30-degree(ish) synthetic quilt, which I love but it's a bit much for late spring/summer/early fall camping and backpacking. I wanted a lightweight summer quilt and I'm happy I found Enlightened Equipment. I ordered my quilt in May of 2015 and received it about eight weeks later as promised based on their peak season lead time. Based on the options as the time, I selected a 50 degree, standard length, wide, 800 fill DownTek Enigma quilt. They indicated a weight of 11.31 ounces during the ordering process. Unlike most lightweight gear I've purchased, the weight came in a bit LIGHTER than promised at 11.18 ounces (without the stuff sack). The quilt shipped with a matching ultralight stuff sack and a storage sack. I found the temperature rating true to form if not a bit conservative when used wearing my applicable base layer as recommended by most to avoid/reduce the transfer of body oil to the quilt. I'm 5'10"/165lbs and chose the wide version for extra luxurious coverage based on my experience with my homemade quilt. The Enigma works great as a hammock top quilt as well. I ordered it with a black exterior and charcoal interior. If I had to do it differently, I'd choose an interior color that contrasted more with the black as it's difficult to tell which is which in a dark tent or hammock. Very cool quilt, John! Thanks for sharing your review! This is a high quality piece of backpacking gear. 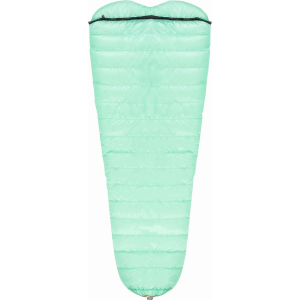 Enlightened Equipment makes very high quality backpacking quilts. However I'm not sure I'm totally sold on the vertical baffle design. It's been said, vertical baffles help with down shift inside the baffling. My experience with vertical baffles is that down shift happens, regardless of which way the baffles run. I also think having longer baffles gives the down more volume to migrate. The best way to keep down from migrating is to have small, well stuffed baffles. Backpacking quilts have a couple advantages over sleeping bags. They also have some disadvantages,especially in cold weather. Controlling drafts is the primary concern. Nothing will wake you up faster than a 9° draft hitting the back of your neck! That is why I prefer sleeping bags over quilts when the weather gets truly cold. The temperature rating of this Enlightened Equipment Enigma quilt seems to be spot on (30°). I have pushed this quilt far past its stated temperature rating (down to 19°) and have found it to hold its own in conditions it wasn't designed for. If you stick to the quilt's original temperature rating and above, you're almost guaranteed to be warm. 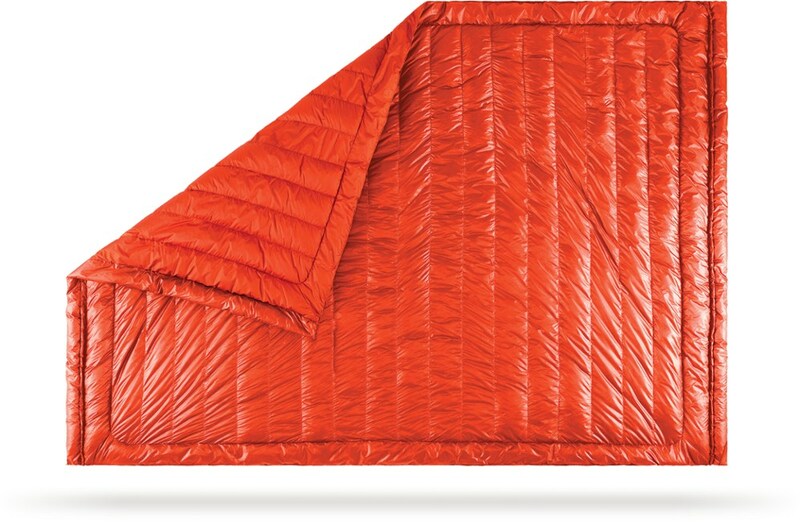 Again this Enlightened Equipment Enigma quilt is a great piece of gear. Highly recommended. Thanks for the review, Alex. Just a piece of editing advice. Most people will not watch a 10 minute video on anything. 2-3 minutes is the recommended attention span my marketing team is telling me to target. Thanks for the review, Alex! Please keep us posted on how your quilt continues to work out. I really like the quilt concept and the shell and quality of construction are excellent. The down however smelled like a wet dog on delivery and the smell persisted for a week. I sent the item back, which they rebuilt/washed, however it still smelled just as strong. I am planning a long trip and can't see myself using this for an extended period of time due to the smell. 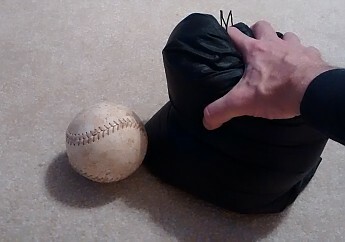 I have a down bag that had a similar odor but it eventually subsided with use. Hang it outside, out of the sun for several rain free days and that might do the trick. Use it for an extended period of time and you yourself will stink so bad, you won't notice the bag anymore:) Mine smelled too but I got used to it and/or it wore off. Admittedly, I have a reverence for poultry smell since I grew up with chickens as pets... Maybe try washing it with a down-washing product like Nickwax. Or perhaps it's just an adjustment you'll have to make if you want to use a nature-made animal product. Merino wool also smells like wet-sheep when it gets wet, but it outperforms anything synthetic. Sorry to hear about the smell. I'd keep airing it out as often as possible. Hopefully that will resolve the problem. Welcome to Trailspace, Rin. Too bad about the smell, but hopefully some of the tips above will help. In addition to those helpful ideas, I also wondered about storing it with one of those charcoal odor-absorbing bags. Please keep us posted on how it works out. Alicia this sounds like a great idea! Let us know how any of these ideas work out, please. Hopefully something will work for you. The Enlightened Equipment Enigma is not available from the stores we monitor.